It wasn’t exactly a Sunny Afternoon on a rainy November day in London earlier this week as I headed up to the Harold Pinter Theatre to catch The Kinks musical of the same name, but coming out of the underground I found myself humming the masterpiece that is Waterloo Sunset and I knew that with a catalogue of songs like this, any musical based on The Kinks’ rise to fame was going to be a good one. I wasn’t wrong. 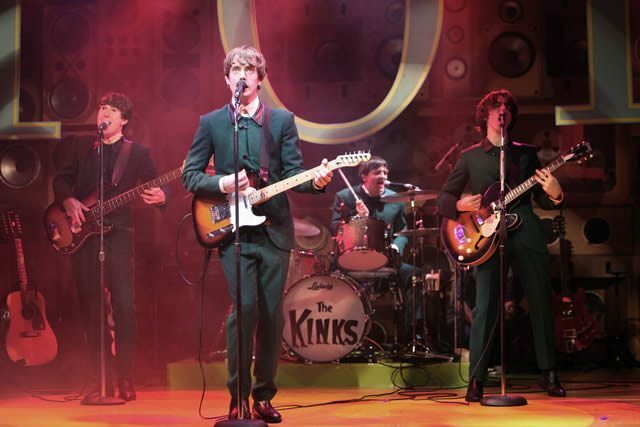 Playwright Joe Penhall begins by transporting us back to the early 1960s where a bunch of cockney working-class boys from North London were just beginning their climb to become one of the most significant and defining bands of the era. Brothers Ray and Dave Davies of Muswell Hill couldn’t be more different from each other. Ray, played brilliantly by Danny Horn, is the cool, headstrong leader of the group who writes the hits and sticks with his one girl by his side, whilst Oliver Hoare plays the younger brother of Dave, whose cross-dressing, womanising wild ways leads him to dangle from a chandelier in a nightgown in one scene as his older brother complains of having to get up early for work the next day, showing just how different they are from each other. Different they may be, but they have one important thing in common – their love of music. 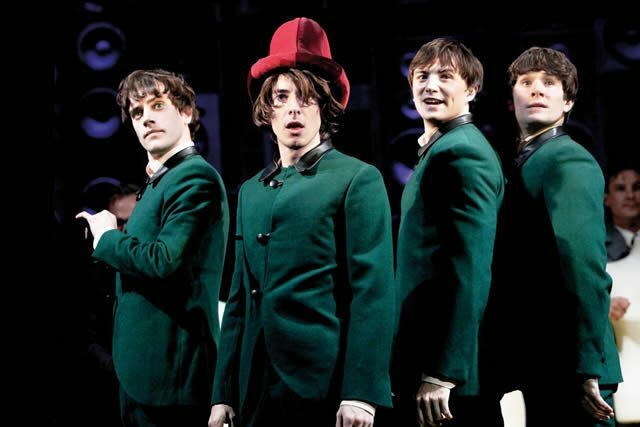 Grabbing mates Pete Quaife (Robbie White in this production) and Mick Avory (Damien Walsh), the lads’ sound soon catches the attention of the big bosses who try to mould them into something they’re not, to no real avail. These money-men continue to look down on the members of the band for being in a different class even once they go on to achieve world-wide fame, showing a mind-set that no longer exists in the way it once did. After being banned from the US stage, the rebellious attitude of the members of The Kinks is tangible as the tensions rise and fallouts abound. However, the down-to-earth nature of boys, especially Ray Davies, enables them to use the power of their music to get through whatever hardships are thrown at them. And powerful the music certainly is. As soon as we hear that unmistakable bass line on You Really Got Me played louder and louder until it feels the whole theatre might explode, you can feel the excitement and concert-like atmosphere from the audience slowly rising. Weaving the best of The Kinks’ back-catalogue with the story of the clashes between classes, big bosses and manipulative contracts and the pressure of fame, Sunny Afternoon also brings major events of the 60s to life such as the victorious World Cup win in 1966 with a magnificent soundtrack that will make you wish you could actually revisit this bygone age. After walking back over the bridge to Waterloo station, sunset might have been long-gone but the lyrics of ‘As long as I gaze on Waterloo Sunset, I am in paradise’, really resounded with me; I felt glad to have been enabled a glimpse into the rise of one of the most important bands to have come out of London.